St. Augustine Beaches News Journal July 2013 11 Fitness room Atlantic Beach & Tennis Club ST AUGUSTINE 155 SR312 West (904) 819-9093 CARRABBAS.COMCome to Carrabbas tonight for one of our signature dishes, Chicken Bryan. Enjoy delicious wood-grilled chicken with caprino cheese and sun-dried tomatoes, topped with our basil lemon butter sauce. ENJOY A TASTE OF TONIGHT St. Johns County Sheriffs Corner By David Shoar, St. Johns County Sheriff It has been nearly 49 years since a hurricane struck the first coast directly from the east and that hurricane, Hurricane Dora has been the only one to strike from the east since records have been kept dating back to 1851. There are only a very small percentage of folks who remember the destruction that Hurricane Dora caused in the early morning hours of 10 September 1964. The storm made a direct hit at then sparsely populated Vilano Beach with its 120 mph winds and a storm surge of 12 feet. Dora continued east to Lake City and then made a right turn and traveled north through Georgia and the Carolinas before going out to sea. The storm caused one death directly and $280 million damage. Although we have been spared from devastating storms we should not let down our guard and be prepared if a hurricane is headed our way, remember it was not too long ago, we had the outer effects of three storms coming from the west coast that caused substantial damage. I would like to once again devote this months column on Hurricane Awareness or Safety. Hurricane season began at the beginning of last month and lasts until the end of November and meteorologists are predicting an above normal season in the Atlantic basin with a possibility that the season could be very active. The National Oceanic and Atmospheric Administration (NOAA), predicts that there will be 13 to 20 named storms. Of those they say between seven and 11 could reach hurricane strength and of those, three to six could become a major hurricane. You should be familiar with the terms Hurricane Watch and Hurricane Warning. A Watch is issued when conditions are favorable that a hurricane could strike in 36 hours. A Warning is issued when hurricane force winds are expected to strike in 24 hours. By this time you should already have an emergency plan for yourself and family and begin implementation of that plan. Some things to consider in your preliminary plans are: angles, it may not look the same once the storm passes. care at a shelter or at home. a storm. located. to the storm. items on your structures (shutters, screens, eaves, gutters, antennas, satellites). chart do if you have to evacuate. them in safe area. Hurricane Awareness When a Hurricane Watch for your area is issued you should do the following: TV, or NOAA Weather Radio, and Internet for updates. to see if they are in satisfactory condition, include batteries. tire pressure. or skylights. are outside. needs for elderly, handicapped, etc. When a Hurricane Warning is issued here are some suggestions: NOAA Weather Radio. and cover. with drinking water. breaker switch. early. Sometimes a hurricane path may not be predictable and evacuation orders could come at any time. If you are asked to evacuate, please do so early and know the route you will be taking. Remember there will be many folks taking the same route from a very large area so be sure to give yourself plenty of time to leave safely. Finally, if you refuse to leave following an evacuation order, here are some safety tips for riding out the storm: constructed. cold. the electricity goes off you can use the ice to keep food cold in the refrigerator. the authorities. water. too strong. even if covered. or closet. doors. other sturdy object. Now is the time to go over your hurricane preparedness. If you have not made any emergency plans, you should do them now. Planning ahead will save you unnecessary stress from not knowing what to do or not having the supplies you will need to get you through the hurricane watch, warning, storm, and aftermath. Print and post this list on the refrigerator or somewhere it will be easily seen. Please visit our website, www.sjso.org for additional information concerning Hurricane Preparedness and of course feel free to drop me a line at dshoar@ sjso.org. It is our hope at the St. Johns and happy summer. 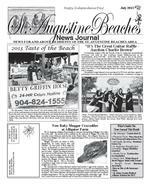 St. Augustine Beaches News Journal July 2013 13 Fresh, Local Seafood Prepared the Way You Like it! Breakfast: Saturday & Sunday 7:30am-10:30am Lunch & Dinner: 7 Days 11am-9:00pm Early Bird Specials: M-F 3:30pm-5:30pm St. Augustines Best Casual Oceanfront Restaurant GRILLED, FRIED, STEAMED, BROILED, SAUTEED or BLACKENED (904) 471-8700 45 Cubbedge Rd. Crescent Beach www.southbeachgrill.net Open For BREAKFAST Saturday & Sunday 7:30 a.m. to 10:30 a.m. Join Us For and more! 1 ALLSTAR INC. Electrical FULL SERVICE ELECTRICAL CONTRACTOR Family Owned Over 30 Years Experience FREE ESTIMATES Call for Discounts & Specials Trouble shooting Circuits Check Mobile Homes TV, Cable, Phone Wiring New Construction Ceiling Fans Repairs Generators Installed Pool & Pond Wiring Service Changes & Upgrades Decreased Power Problems Washer/Dryer Receptacles Indoor/Outdoor Wiring Surge Protection 24 HOUR EMERGENCY SEVICE 904-460-1001 CALL! WE DO IT ALL!! Credit Cards Accepted Publix Center, St. Augustine Beach 904-471-2830 The Celebrity Judges: Mayor of St. Augustine Beach S. Gary Snodgrass, Chief of St. Augustine Beach Police Department Robert Hardwick, Council on Aging Director Cathy Brown, Director of the Scenic Highway Sallie O'Hara and the Director of the Tourist Development Council Glenn Hastings rated the winning restaurants as follows: Appetizer: 1st Place: Sunset Grille for Chowder Fries 2nd Place: Napoli's Italian Restaurant for Crab Empanada 3rd Place: Mango Mango's for Caribbean Lobster Crab & Corn Fritters Entree: 1st Place: Salt Life Food Shack for Poke Bowl 2nd Place: Sunset Grille for Ahi Tuna Taco 3rd Place: Purple Olive for Blackened Grouper Dessert: 1st Place: Purple Olive for Chocolate Pecan Gateau Cake 2nd Place: Salt Life Food Shack for Hot Blond 3rd Place: Amici's Italian Restaurant for Limoncello Judges' Choice: Taste of the Beach First Place Judges Choice Panama Hatties First Place Desserts Purple Olive First Place Appetizer Sunset Grille First Place Entree Salt Life 1st Place: Panama Hatties for Grouper Reuben 2nd Place: MangoMango's for Carnita Pulled Pork 3rd Place: Sunset Grille for Ahi Tuna Taco People's Choice: 1st Place: Purple Olive, 2nd Place: MangoMango's 3rd Place: Sunset Grille The St. Augustine Beach Civic Association wishes to express its thanks to all the participants that made the Taste of the Beach a success this year. St. Augustine Police Department St. Augustine Beach Department of Public Works: Troy Jones and Richard Gray City of St. Augustine Beach: Melissa Burns. Volunteer Coordinator: Verna Brown Artists: Doug Brown of Dixie Pottery Studio, Susan Mele, Kyle Hunter of Hunter Glassworks. Musician: Kenyon Dye. St. Johns County: Will Smith. Burkhardt Beer Distributors, Tim's Wines, Signs Now, Taylor Rental Thank you to our volunteers: From the St. Johns Business Network: Michael and Allison (continued from page 1) Cunningham, Connie Mista, Vincent Neugent, Pat and Jay Kane, Graham Charlton, Harry Waranch, Michael Salley, Dan Hubley, Colleen Messner, Ron Berry, Bruno Silva and Leslie Silva, Marshall and Tasha Peters. Civic Association Volunteers: Robert & Andrea Samuels, Bill Jones, Amy Kozuch, Gaye Jones, Fran Madera, Rachael Bennett, Bill & Nina Genovese, Tony & Joannie Torella, Cliff Logsdon, Phoebe Wehr, Kelly & Scott Mumford, Jamin & Amy Rubenstein, Greg Alatis, Angi Bell, Annette Petrick, CJ McCartney, Carol Austin, Carol Bertacchi, Carrie Gaynor, Donna Tippit, Gay Marsh, Gene Austin, John Thomas, Julie Gorges, Kate and Richard Parkhurst, Kathy Furtado, Katlyn Black, Kelly Fales, Laura Kelly, Lisa Ridenour, Margie Black, Marla Taylor, Maru Perez, Memory Hopkins, Merrill Roland, Nancy Hubbard, Paul Wenglowski, Taigan Ridenour, Sophie Moulas, Ruby Hauder and Tracy Trezza. If we have forgotten anyone our sincerest apologies.